Yellow hard hats are no more! One of the questions we get asked most by our tiling customers is, ‘Which size scoring wheel do I need to cut porcelain / ceramics / marble, etc. ?’ Rubi manual tile cutters allow the use of interchangeable cutting wheels, but it appears less than clear as to which diameter wheel to use and when. The aim of the ideal scoring wheel is to score just once to get the cleanest snap, especially on ceramics. In order to do so you need the most relevant cutter and wheel (not one without the other). 6mm scoring wheels are ideal for ceramic and glazed tiles. They produce a shallow line. Any deeper and it might produce crack marks and can sometimes be prone to chipping the tile. 8mm cutting wheels are good for porcelain and floor tiles because the blade is narrower, giving you a deeper cut, and in doing so it gives you a better chance at snapping it in one go. 10mm scoring wheels are great for ceramic stoneware. Normally these tiles are slightly more textured (even on a minute scale) so the larger wheel doesn’t deviate on any crevices. The tiles are generally still quite polished so, like the 6mm wheel, this gives you a shallow cut, but it’s slightly wider, allowing you to snap stronger material. 18mm+ cutting wheels are for rough ceramics and difficult cuts. They give a deep and wide cut and are great for textured tiles. There is also less deviation and these wheels are normally better suited to scoring multiple times, depending on the thickness/material of tile. On heavy, textured tiles it is advisable to score a few times to make the scoring line as continuous as possible. Clean the wheels at the end of the day/job to prolong the life span. This can be done be wiping with a cloth or submerging in lubricant. We hope you find this guide useful. 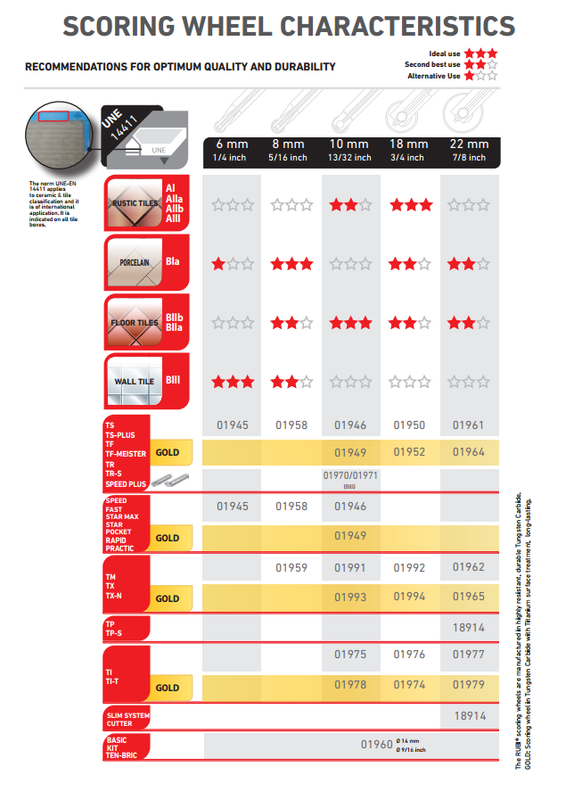 If you require any further information on scoring wheels then please feel free to email us at sales@buybrandtools.com. 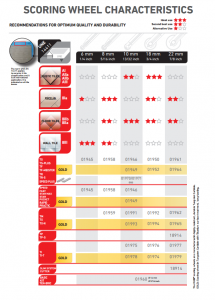 The complete Rubi scoring wheels range is available to buy online at Buy Brand Tools.